Nadia: How did you discover that dogs can sense low blood sugar? Mark: In 1999, when I was on a business trip to New York City, a guide dog puppy, Benton, aroused me in the middle of the night from a low blood sugar incident, allowing me to get help. Whether Benton reacted to a change in scent or in the symptoms that I was exhibiting is unknown; however, that incident resulted in my idea of training a dog for this purpose. Based on my background in forensic science, I am familiar with blood alcohol devices, which can differentiate an alcohol-based problem from a low blood sugar event. I then spent several years studying dog scent training protocols for drugs, bombs, and search and rescue, as well as cancer detection. Along with extensive experimentation regarding the diabetic scent, I proved the capabilities of the dogs, and I developed a series of protocols that have been further tested over the last several years with well over 100 dogs. D4D currently supports over 80 client teams. Our longest working dog is Armstrong, with over eight years of alerting experience. Nadia: Does a dog have to feel a connection with a person to detect low blood sugar? Mark: There are many characteristics that make a dog successful in a working relationship that provides this type of medical alert. One of them is the bond he develops with his companion. However, there are many other characteristics that both the dog and his handler initially need to become a consistent and reliable team. We have a number of criteria that we use to select the dogs for our training program. Our sources for dogs are primarily Guide Dogs for the Blind of San Rafael, California, and Canine Companions for Independence of Santa Rosa, California. The dogs they provide to our organization have been bred and trained from birth for service work. With these excellent dogs and our proven selection criteria, we eventually place approximately 75 percent of the dogs that we train as members of working teams. That is an excellent success rate when you consider the placement rate of other accredited service dog organizations. This is a good place to remind people that organizations that attempt to train pets or other non-service trained dogs will not meet the service characteristics for their dogs that comply with the requirements of the Americans with Disabilities Act for public access. Additionally, while a small percentage of dogs will have a natural and strong drive to sustain this work ethic, most teams need ongoing support to sustain the process over the potential working life of the dog. Based on our experience, this has been an issue that is very clear. Nadia: If you are in a public place and someone near you has a low blood sugar, will your dog alert that person, or is the dog trained to sense only your unique smell? Mark: While the scent is universal, our dogs bond and work with their handlers. As such, they typically do not alert on others. However, there have been incidents where this has happened. But it can be a sensitive situation, given that not all diabetics are readily open about their disease and some would prefer not to be identified. Accordingly, our clients are asked to be respectful as possible toward other people’s privacy. Nadia: How many scent sensory cells do dogs have? Mark: The smelling receptacles for dogs vary by breed. The breeds of dogs that we train, Labrador retrievers and golden retrievers, have over 200 million sensory cells used for scent detection. Bloodhounds have over 300 million. Other breeds have fewer, but still can exceed 125 million scent sensory receptors. Dogs can discriminate scents at concentrations millions of times lower than humans, who have only five to 10 million scent sensory cells. Nadia: How did you develop the science confirming that dogs can indeed be trained to smell low blood sugar? Mark: I have extensive experience and training in scientific processes. 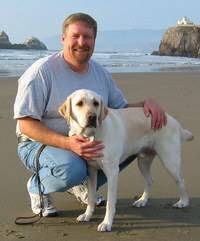 The initial work that I did was to study existing information and work with professionals in dog scent training. There are many studies regarding scent training and the use of dogs in criminal work and other areas. The work that I did, pertaining directly to diabetes and low blood sugar, involved significant experimental effort by myself and others in developing our protocols. It included type 1 diabetics and persons skilled in scent training for drugs, bomb detection, cadaver search, and cancer detection. We continue to have individuals in these areas consult for our program. We also have had the benefit of medical professionals who provide regular feedback, as well as scientific researchers who assist us in evaluating our processes and results. Nadia: I have learned that some dogs give their owner a stuffed animal to alert the owner about low blood sugar. What’s behind that? Mark: I can’t comment on other programs’ use of particular items to provide an alert. We have used a variety of techniques to have a dog indicate that it has detected the scent. Our preferred method is to use a bringsel, which is a small stuffed tube that hangs from the dog’s collar or the client’s belt loop. Our alert method was adapted from techniques used by cadaver search dogs. The dog is trained to hold the bringsel when it detects the scent. The objective is to have the dog provide the alert with a behavior that is distinctly different from other normal dog behaviors-a sure sign as to what is occurring. Nadia: If someone wanted to try training her own dog to detect low blood sugar, could you give her instructions on how to go about it? Mark: Training a dog to provide an alert to a potentially life-threatening condition is a serious matter. It requires a clear understanding of the medical condition, as well as of dog behavior and training skills. Dogs have been known to assist their close human companions spontaneously, but the anecdotal information does not prove that it is due to scent recognition, or empathy the dog may feel from the onset of serious symptoms. Scent training has the potential to provide an alert prior to the onset of the condition, while in these cases the dog’s recognition of symptoms is a reaction after the condition is present. We believe that no one should undertake the training of dogs for this purpose without a clear understanding of all the risks. For an organization to attempt to teach untrained individuals to try to do this and then attempt to rely on a dog so trained is a recipe for disaster. Organizations attempting to provide training to individuals to self-train their dogs for this purpose would not seem to understand the full range of risks and will likely see a high degree of failure. Any program providing dogs for this purpose must have the appropriate background and quality assurance techniques and provide the ongoing support needed to sustain the working dog-handler relationship. Accordingly, it’s our policy to not offer advice on the training of dogs to detect hypoglycemia to nonprofessional trainers. There are medical risks that we cannot assume responsibility for without the ability to directly participate in or monitor both the dog and the diabetic’s process. How Does D4D Decide Who Gets a Dog? Nadia asked D4D’s executive director, Susan Millhollon, how people can apply for a service dog. Nadia: What qualifications do you require from someone who applies for a service dog? We have three basic requirements: diagnosis, age, and geographic proximity. 1. Applicants need to have been diagnosed with diabetes for at least one year and be insulin-dependent. 2. Applicants must be at least 12 years old. The reason for this is twofold: The success of our dogs requires a primary relationship with their diabetic handler, and the dog must be 100 percent the responsibility of the person with diabetes to ensure a strong bond to support hypoglycemic alerting. Our experience is that children under the age of 12 are not ready for this responsibility. There is also a safety concern. Because our dogs each weigh more than 50 pounds, it is physically difficult-for some, impossible-for a young child to manage a large dog. 3. D4D requires applicants to live in Northern California within an approximate two-hour commute of our Concord Training Center. Prior to receiving a dog, applicants must attend a minimum of 100 hours of training that covers such topics as handling and training a service dog, healthcare and safety, ADA public access requirements, and hands-on experience managing a dog. Our experience is that clients assimilate that enormous amount of information best over time. D4D’s training is scheduled typically over two-plus months, with sessions occurring on weekends or weekday evenings. Following training, clients are expected to participate in follow-up care and classes over time, as well as attend annual recertification. All of this requires reasonable geographic accessibility to encourage continued involvement. Nadia: How does someone go about applying? Susan: We suggest interested parties learn more about D4D by going to our website at www.dogs4diabetics.com. Applicants who meet the basic qualifications can complete and submit a short application online. We review and acknowledge, then advise applicants on the next step. We provide an extensive application to those who meet the initial qualifications. We ask for detailed information from an applicant’s healthcare provider. We also ask for an accounting of the applicant’s home environment, family support, and lifestyle. Safety for both the diabetic and dog is a primary concern. Success in partnering a strong team requires the person with diabetes to be actively engaged in managing his/her disease. D4D dogs cannot alone improve the diabetic condition, but in partnership, work as a tool to improve the life of a diabetic. Nadia: How does the selection process work? Susan: D4D’s application specialist, a professionally trained nurse with years of experience with diabetes, manages the application process. The short application is reviewed primarily to see if it meets the basic qualifications I described above. Our application specialist does the initial review of each long application, then presents it to a review committee for discussion and consideration. Applicants approved by this committee are contacted for a face-to-face interview with an assembled group that represents dog and healthcare interests. The final step in the application process is a home visit to assure safety for the dog. Nadia: How many service dogs do you train a year? Susan: On average, we train 20 to 25 dogs per year. Nadia: Do you have a wait list? Susan: Yes. We receive approximately 100 requests a month, but are only able to accommodate less than two percent. Nadia: What are the fees associated with getting a service dog? Susan: A D4D service dog is valued at approximately $35,000 to $45,000 by the time it’s placed with its diabetic team partner. The total cost to the person with diabetes for a dog currently is $150, which covers an application processing fee and training supply costs. Nadia: Are there any other organizations in or outside the United States that are using service dogs to detect low blood sugar? Susan: There’s a growing number of organizations, as well as trainers, claiming to provide service dogs to assist people with diabetes. Some are successful, while many others are not. Training methodology, client services, including client training, follow-up and continuing care, and costs-up to $50,000 a dog-create a confusing variation in outcomes. At times there have been disturbing misrepresentations in the industry, resulting in broken promises to consumers. D4D’s goal as an industry leader is to leverage its expertise to set and maintain standards and educate the public. Nadia: What advice can you give people who live in remote areas about possibly training one of their dogs? Susan: With our limited resources, we have to determine how to serve our client base most effectively. This includes consideration of a client’s ability to come to our training center for assistance. We have formed remote support groups, based on where our clients live, to help the support process. We’re expanding them as we grow, but they have to be based on the availability of resources. Persons living in more remote areas are difficult for us to serve, and, as Mark indicated above, we do not teach persons to train their dogs themselves. Somebody looking for that type of assistance may want to do research through a reputable organization like Assistance Dogs International to find other organizations that may be able to provide them with some assistance. We’re currently updating our website to include service guidelines, as well as consumer questions that can help guide a search.